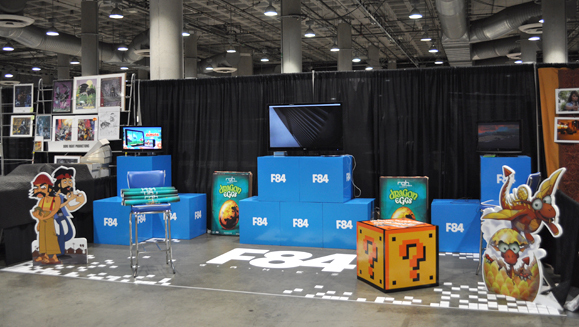 On November 5th & 6th, F84 Games participated in the first ever Comikaze Expo at the LA Convention Center. Los Angeles’ answer to San Diego’s Comic-Con, sure did bring in crowds. The weekend long event drew 30,000 people. The F84 team had the opportunity to interact with the diverse attendees, which covered the entire demographic spectrum. Children were fascinated with our apps including “Dinger” and “Dragon Eggs”. Their parents had to wait, while they took turns playing our titles on the iPad. The facebook generation and beyond, were excited when they learned about our “Cheech n’ Chong facebook game”. And, they were eager to snap a picture with the Cheech n’ Chong standee. The event included thousands of loyal fans who donned a variety of super hero and pop culture costumes. Many of them stopped by our booth with enthusiasm and interest in our titles. It was a pleasure having 1-1 contact with our audience and we look forward to next year’s event.